A charcoal grill is a barbeque that uses heated charcoal to cook your food. It also has a grill plate to give it those lovely charred lines. You can use a charcoal grill for almost anything – including meat, fruit, and vegetables. A charcoal grill is a messy unit with which to cook and can also take a lot of time and setting changes. Therefore, you may like to do your research before jumping into a purchase. Check out these options below, pay attention to the size, how many people they can feed, how effortless they are to care for, and how long they will last. Customer reviews count for a lot. Then, once you buy your grill, remember to keep it clean and cover it when you’re not using it. You can then rest assured you have an outdoor cooking unit that will last a long time. Here are a few options that may be worth your consideration. Nothing beats the taste of food that comes directly off the charcoal grill, but they can often be expensive to buy. Fortunately, Royal Gourmet now offers a low-cost charcoal grill that allows you to enjoy that smoky barbeque flavor more often. 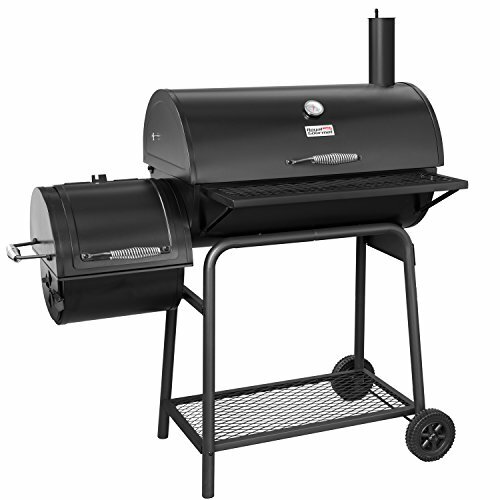 This one comes with an offset smoker to add even more flavor than usual, and you can choose to buy it with or without a cover. However, given that the paint peels off and the rust takes hold, you may like to spend a few more dollars and get a cover to protect it from the elements. The paint can become a considerable problem otherwise. Aside from this problem, there’s a lot to love about this charcoal grill. It includes 800 square inches of cooking space, a 438 square-inch main chamber, and quarter-inch porcelain steel cooking grates. It won’t be long until you’re cooking up a storm. 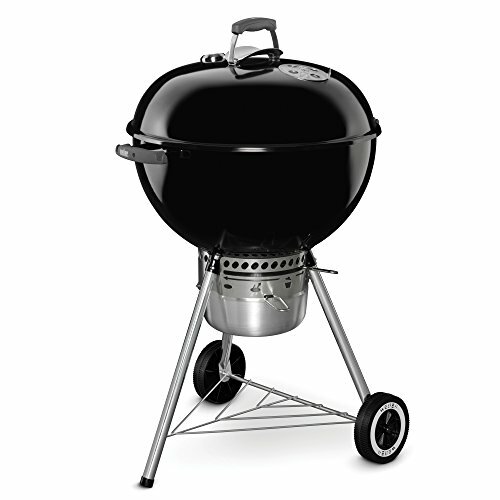 What’s more, for the affordable price tag, you also get side doors which provide easy access for refilling the five-pound charcoal pan, as well as a cool-touch spring handle, a front table, lifting handles, and wheels for transportation. This grill is not going to surpass other brands regarding quality, but its long list of features sees it more than worth a closer look. If you’re looking for a charcoal grill that’s both stylish and effortless to use, then set your sights on this model from Mecor. While it’s a lower-end model regarding its price tag, it still packs a punch with how much fun you will have cooking on it. It will also stand out in your cooking area for its style. It has a sleek, black color scheme, a traditional-style feel, and still has plenty of room to cook up a storm. Enjoy the burn box for more substantial meat, then the main 24.5 x 12-inch cooking area for smaller food to cook. 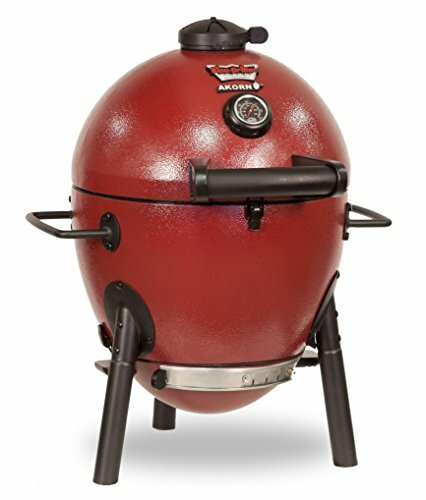 The entire charcoal grill features coated, cold-rolled steel to last the distance, and to a degree, is rust-resistant too. However, like most charcoal grills, once the paint flakes off, it may lose that rust-resistant property. The burn box won’t lose paint but the other areas of the grill might. These points aside, you will have no problems using this charcoal grill for all your cooking needs. It has rolling wheels so you can move it anywhere on your property, and the wooden shelf proves convenient for housing tools and things with which you are cooking. It will also cook evenly thanks to the side ventilation that enables the air to flow smoothly and freely. Even without paying the earth, you are getting a whole lot of charcoal grill for the price! 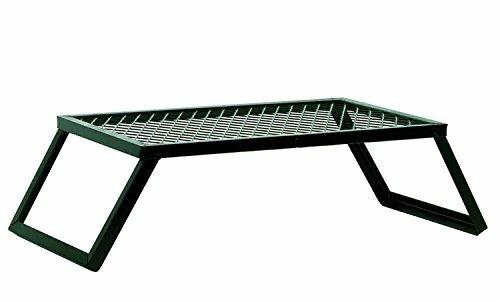 While you might have a battle on your hands to assemble this charcoal grill, that’s where the bad points end. When it comes to value for money, this charcoal grill is at the top of the list. It’s large, stylish, and suitable for family and friends gathering for dinner. It also doesn’t take a genius to use it. You can buy this charcoal grill with or without the cover too, but you may find it’s in your best interests to cover it for protection against the elements when you’re not using it. It has a generous-sized cooking plate, uses only the best porcelain enamel steel wiring that money can buy, and even the warming rack is expansive so you can stack up your cooked meat high for people to take. If you want your food to cook perfectly, the lid-mounted temperature gauge can help too. This device is relatively accurate – even if the selector lever lets in too much air and affects the cooking process. A nice touch is a handle which remains cool throughout the cooking process. This sturdy, robust, and high-quality charcoal grill could be the very thing you need to cook up a storm in the summer months. If you’re looking for a charcoal grill that can do it all and do it well, then set your sights on this model from Z GRILLS. Unlike other charcoal grills that can grill but not a lot else, this one can do it all. You can use it for grilling, smoking, barbequing, roasting, baking, and braising. It also has an expansive hopper area to help keep it operating for longer. What users will also appreciate about this charcoal grill is its temperature regulator. It comes with a smart digital controller, remains consistently between 180 and 450 degrees-Fahrenheit, and operates on hardwood pellet fuel alone. It doesn’t get much better than that. This heavy-weight charcoal grill also features the best of the best with all its materials. It has a premium warming and cooking area – even if the cooking area is smaller than other barbeques, and it’s portable so you can move it around your property. The icing on the cake is the lifetime warranty which offers peace of mind for any manufacturer defects that pop up. All in all, this is a charcoal grill that’s well worth adding to your wish list for summer. Even though the size of this charcoal grill is a bit deceiving, it’s still going to be a helpful unit to carry around with you in the bed of your truck for cooking up a storm. Open up the tailgate of your pickup, get out your favorite meat, and get cooking – it’s that easy! This charcoal grill comes with an affordable price tag, and you can also choose whether you want a 22-inch or 18-inch grill. Both are small but suitable for cooking for a few people at a time. It also has wheels to make it portable and features rust-resistant aluminum so that it can last a long time. The grate features plated steel to make it easier to clean, while it even comes with porcelain enamel coating too. Sealing the deal is the traditional style. Even though this charcoal grill doesn’t let you cook a lot at a time, it makes up for it in how spunky and cool it looks. You will enjoy traveling around to events with this grill in the back of your truck. If a regular charcoal grill doesn’t take your fancy as you don’t need something large and cumbersome, then maybe this grill from Giantex could suit you a bit better. While it doesn’t look like a grill in a traditional sense, it operates the same as one but without all the heavy pieces to go with it. You can use it at home, while you’re out camping, or anywhere you like. It can comfortably feed up to ten people while still having room left over for side dishes on the shelves. The cooking area itself is not overly generous, but as a charcoal grill you won’t use every day, it more than meets the mark. What you may also enjoy about this charcoal grill is its cleaning process. Unlike other grills that can take hours to clean, this one takes mere minutes. It features stainless-steel material which takes a few wipes until it’s looking as good as new. You won’t get the traditional smoky flavor of a regular charcoal grill, but you will get as close enough to it without going overboard with a large unit. 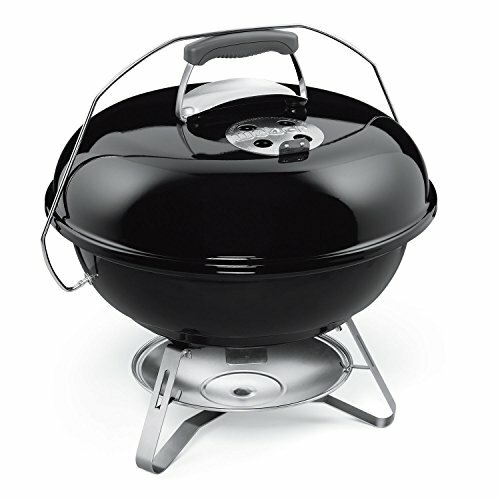 Most people know that Weber sells an amazing charcoal grill, and all their products are top of the range. This charcoal grill is no different, even if it has a few faults. It’s a 22-inch grill with 363 square inches of cooking space. Therefore, you can cook for a significant number of people, even though the kettle shape can be deceiving. The vents are rust-resistant, the cooking grate features steel, and it has a one-touch cleaning system to make taking care of business a breeze. 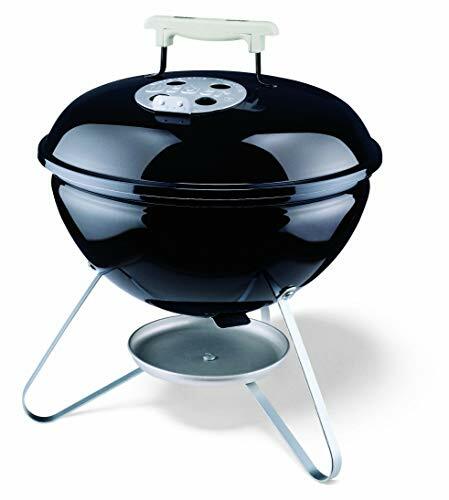 Then, you get to benefit from the generous ten-year warranty period, heat shield for safety, and the ash catcher to prevent the charcoal grill from making a mess. There’s no denying it has many features to make it worth its price tag. However, it can be a challenge to assemble, and the wheels feature cheap plastic. Moving it around is not that easy as a result. Its lid also doesn’t attach to the barbeque which can be a pain when you have to pick it up off the ground. For what it is and does, it’s also quite expensive, especially if you compare it to other charcoal grill brands. In saying that, Weber is a brand you know and trust, which means it’s still a grill you would like to consider buying anyway. Everyone knows the name Weber because they produce an excellent charcoal grill. In the case of this one, however, it’s brilliant, but not out-of-this-world amazing. It has everything you would expect in a charcoal grill, but with a few minor imperfections which may have you reaching for a more affordable and useful product. Its 18-inch diameter with 240 square-inch cooking area is perfect for what most families require. You can cook up a storm without having to wait too long to add more food. It also has a plated steel cooking plate which is effortless to clean and distributes heat evenly. If you’re worried about rust, don’t be. This unit comes with rust-resistant dampeners to give you peace of mind it will last the distance. One of the substantial let-downs, however, is its handles. While they are glass-reinforced nylon handles, they feel like plastic and break like plastic too. It won’t be long until you need to replace them. This charcoal grill will be suitable for a lot of people, but there are also more affordable and quality options available too. 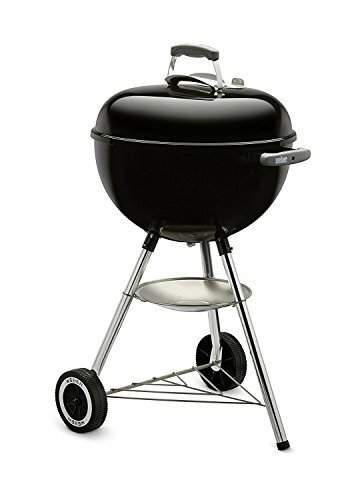 Even though there are a few issues with the quality of this charcoal grill, the unique style and ease with which you can cook can see you buying it anyway. It will cost you more to do so, however. Because you are purchasing the Weber name, you do pay more for the privilege. 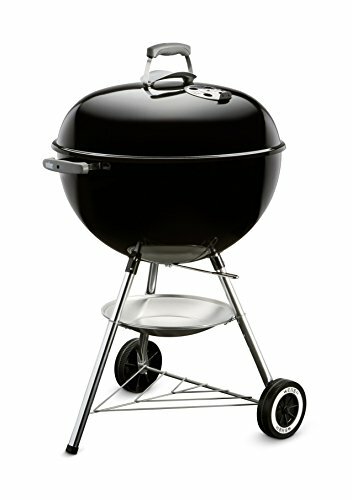 However, if you are cooking for your family and friends, this charcoal grill will more than suit your needs. It has a unique style with its copper porcelain-enameled bowl, and you get to benefit from 363 square inches of cooking space too. If you usually have trouble igniting your barbeque, this one won’t give you any hassles thanks to its Touch-N-Go ignition system. 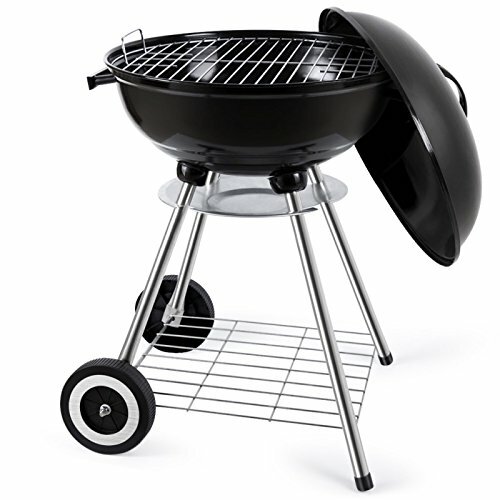 This Weber charcoal grill solves other problems for grill users too – the cleaning rigmarole. You don’t have to spend hours with a wire brush, for this grill offers a brilliant one-touch cleaning system. If that’s not enough to convince you to spend a little more on this charcoal grill instead of another, then the even heat distribution, built-in lid thermometer, and cook timer might. Your entire grilling experience is bound to go off without a hitch. Everyone loves the smoky, charred flavour of meat cooked on the grill, but the hassle associated with finding the perfect appliance can put a lot of people off. If you want the best grill money can buy, without all the trouble that goes with it, then consider these points below. You can then purchase a new one with far more confidence. Think of the number of people you will be feeding and compare it to the cooking area size. Don’t look at the charcoal grill size as a whole, but the internal dimensions of where you can cook food. Usually, suppliers tell you how many people you can feed at any one time. One of the many reasons why people don’t cook on a charcoal grill often is that it takes too long to clean afterward. When you have your eye on a new grill, look at the area you will need to clean and how the manufacturer combats it. Many brands such as Weber come with a one-touch cleaning system to make that process a bit more straightforward. If you plan on cooking at home, at the beach, or while you’re out camping, then your charcoal grill needs to be portable. Does it have wheels? Is it lightweight to shift? Consider these points. Finally, will it last the distance? Consider all the possible materials and choose a barbeque that will handle the elements. Where possible, make sure your charcoal grill is rust-resistant and comes with a cover to protect it. What’s more, if it has a lot of stainless steel, it’s going to last longer too.